Neo Bomberman was an MVS arcade exclusive game in 1997, but today, can be converted into an AES home console cartridge. Note 2: This game was played on a Neo Geo AES that was modified to output in component video (red, green, blue). It was connected to a 32-inch HD tv. Quick History: Neo Bomberman was released for the Neo Geo MVS (arcade cabinet) in 1997. Despite being released for the MVS, Neo Bomberman was one of several Neo Geo games that did not receive a release for the AES home console. 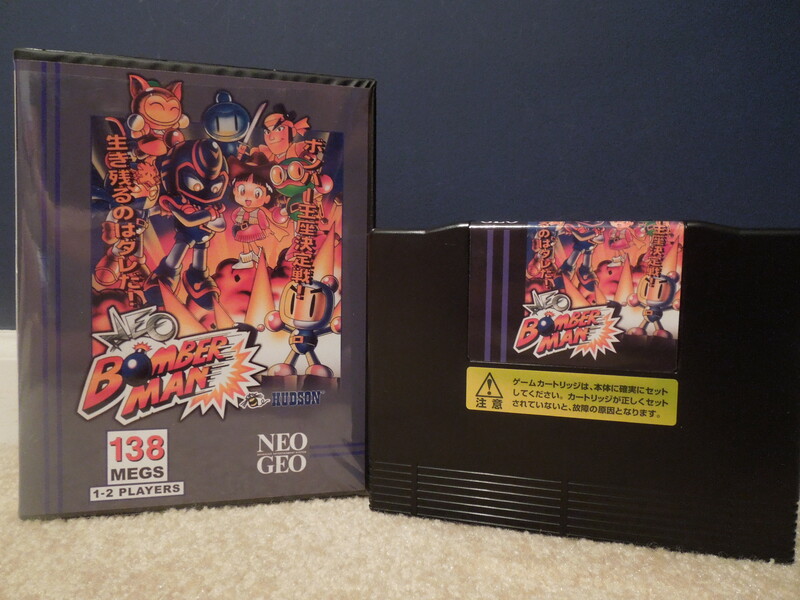 Today, however, Neo Geo MVS arcade cartridges can be converted into AES cartridges, making it possible to play these games on the home console Neo Geo. The Neo Bomberman AES cartridge used for this review is a professional conversion, meaning the boards from an MVS arcade cartridge were put into an AES cartridge. Neo Geo Memory Card: The Neo Geo memory card does NOT function with Neo Bomberman in any capacity. Neo Bomberman is one of the few games in the Neo Geo library that does not allow ‘saving’ of any kind. Setup on the AES: Perhaps because Neo Bomberman was not originally intended to be played on an AES home console, it retains some of its MVS ‘arcade’ settings when you turn it on. For example, you have unlimited Credits (although you don’t need to ‘insert coins’ by pressing Select – the game appears to be set to ‘Free Play’). In most Neo Geo AES games, you are given exactly 4 Credits to try and beat the game, and you cannot change this. However, because you can’t ‘save’ your game in Neo Bomberman after you die, it’s a good thing that you have unlimited Credits, because beating the game with a limit of 4 Credits would be extremely difficult. Also, the game displays ‘Level 4’ at the bottom of the screen at all times. This refers to the ‘difficulty’ of the game, and was common when you played these games on the MVS arcade cabinet. Arcade owners were able to set their MVS cabinets from 1 (easiest) to 8 (hardest). So, basicially, ‘Level 4’ is Normal. You cannot change this unless your system has been modified to allow you access to the system BIOS, but fortunately, ‘Level 4’ (in my opinion) is perfect – challenging, but not impossible. 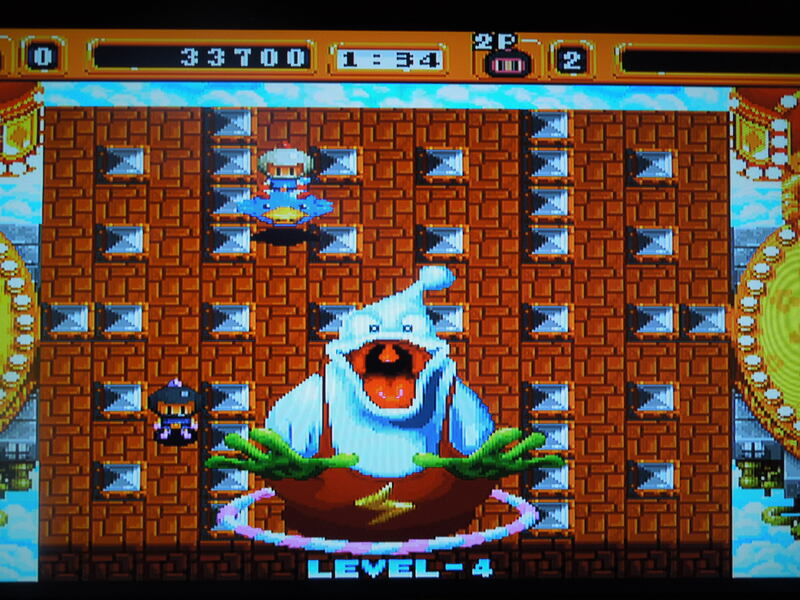 Neo Bomberman is not exactly the same on an AES as it is when played on an MVS arcade cabinet, as you do have the ability to Pause the game by pressing Select. Two different modes, Normal and Battle, are available for play. 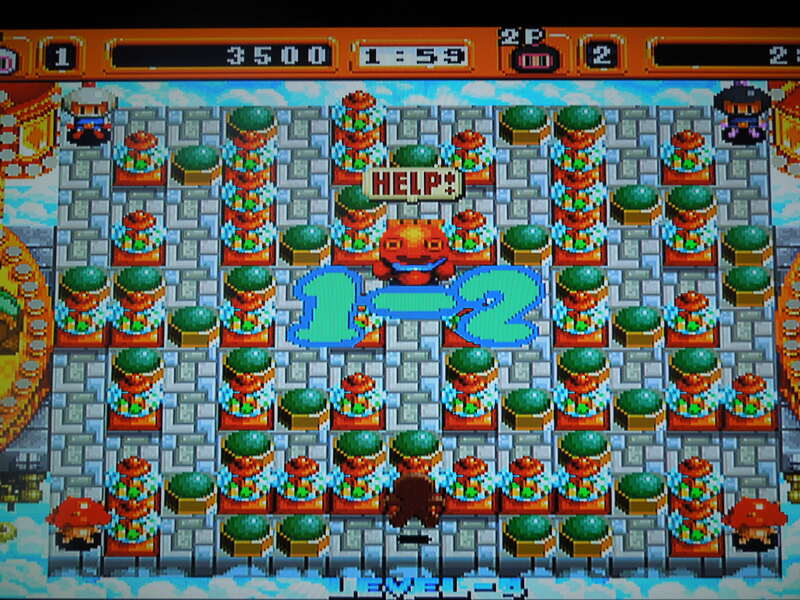 Gameplay: In Neo Bomberman, you navigate maze-like, single screen levels. While walking around, you drop bombs that destroy certain blocks/barriers and allow you access to the rest of the screen. 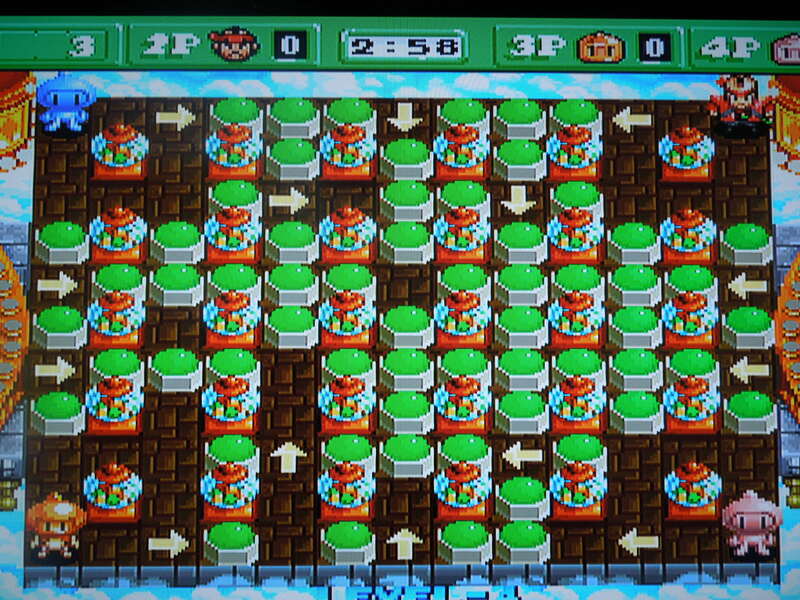 The goal, in either mode (below), is to avoid being hit by either an enemy or an enemy’s bomb while trying to destroy your enemies with your own bombs. As you blow up parts of the stage, you’ll uncover icons, like ‘Fire,’ Bomb,’ ‘Glove,’ or ‘Kick’ icons that allow you to drop more bombs at once, increase the range of your bombs’ blasts, pick up and throw bombs, or allow you to kick your set bombs toward your enemies. You’ll also uncover various animals to ride, some of which have special powers, like the ability to ride over obstacles. 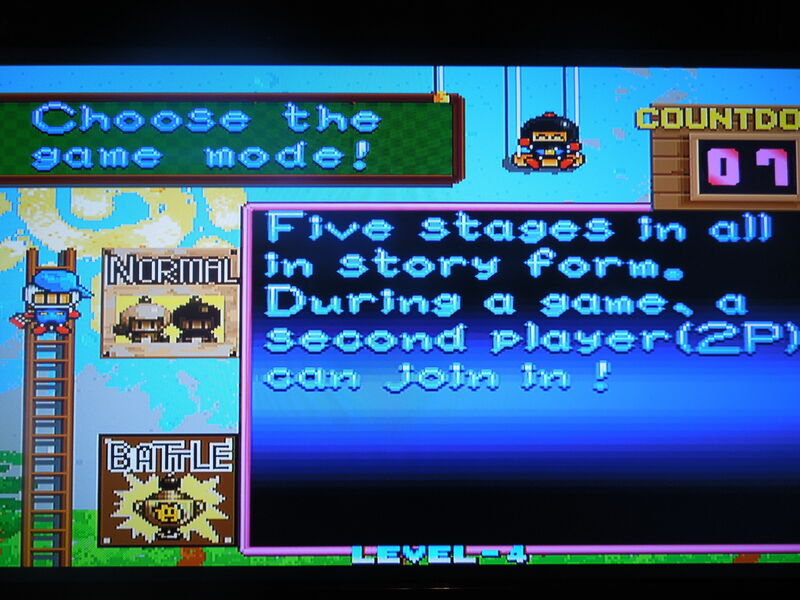 Modes: There are 2 selectable modes in Neo Bomberman, Normal and Battle. Normal Mode: In Normal Mode, Player One is White Bomberman, and Player 2 is Black Bomberman. The player(s) play through 5 Levels, each of which have between six and eight stages. For example, Level One consists of Stages 1-2, 1-3, 1-4, 1-5, and 1-6. The last stage of each level is a boss fight, and after beating all 37 stages and 5 bosses in the game, you’ll have beaten the game. Each of the 5 levels has its own unique look and different enemies. The goal in each stage (excluding boss fights) is to kill all of the minor enemies with your bombs and get into the Exit Portal before the 2 minute time limit expires (if it expires, you’ll lose a life, and the clock will reset to 2 minutes). In 10 of the 37 stages, you’ll find cages that contain captured Bombermen – blowing these up releases the prisoners, and they’ll ‘help’ you by trying to kill the enemies – although sometimes they’ll inadvertently bomb you, so be careful with them. 1 or 2 players can play through the 37 stages of the Normal (Story) Mode. 2 human players: In Battle Mode, if 2 human players want to play, you’ll compete in a 1-on-1 ‘First to 2 wins’ matchup on one of four selectable playing fields. 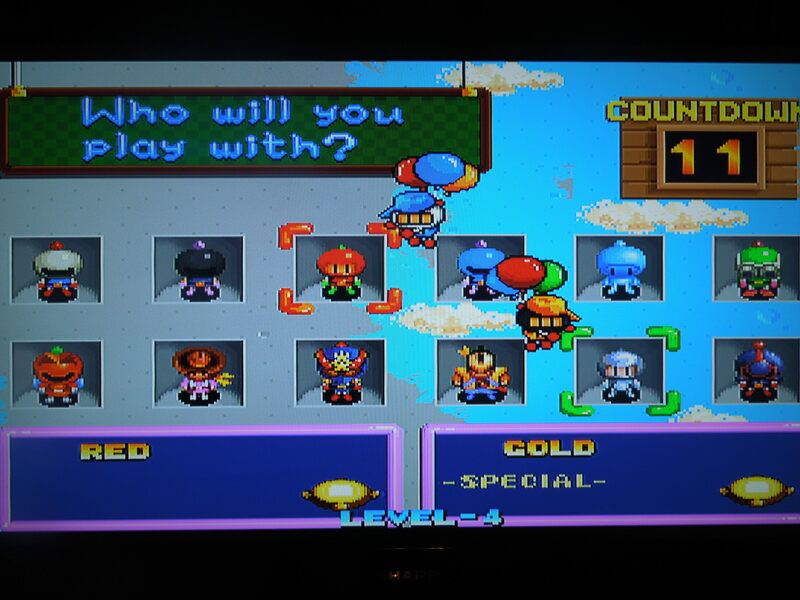 Each human player can select among 12 characters – Bombermen or other characters from the Bomberman universe. 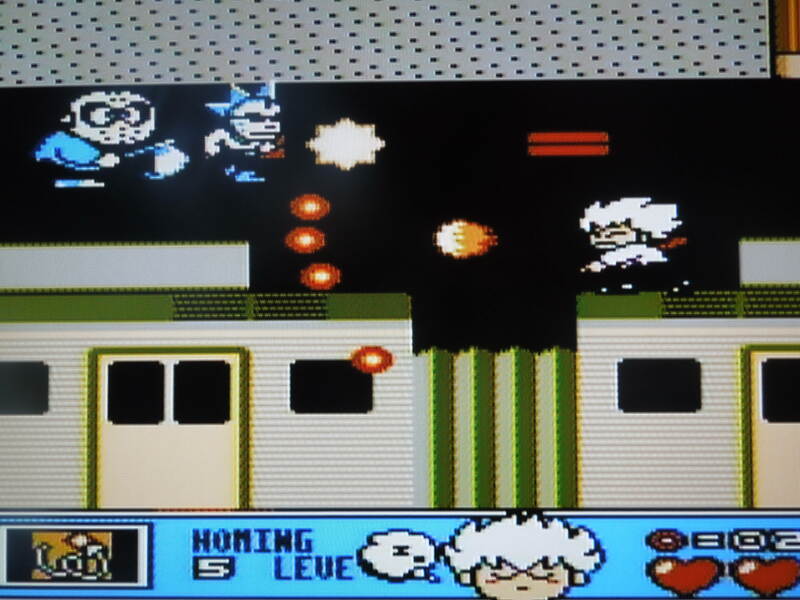 Most of the characters have their own unique ‘moves,’ like the ability to dash, turn themselves into a ‘fake’ bomb, or teleport to a random location on the playing field. *Special moves for these characters are activated by pressing Down + B, Left or Right + B, or A + B, depending on the character. After one player wins two matches, the other human player will need to press Start to play again. With 2 human players, there will never be other CPU controlled characters in Battle Mode. In Battle Mode, 2 human players can fight it out in a ‘First to 2 wins’ match – no CPU opponents appear if two human players are playing in Battle Mode. 1 human player: In Battle Mode, with only 1 human player, you’ll select your character, select a playing field, and play a ‘First to 2 wins’ matchup vs one CPU-controlled character. If you beat your opponent twice, then you’ll play the next round vs. 2 opponents. Keep winning, and you’ll eventually play against 3 CPU-controlled characters, and that’s when things get really frantic. Each of the Battle Mode’s 4 stages has 5 ’rounds’ (round 1 vs one character, rounds 2 and 3 vs two characters, and rounds 4 and 5 vs three characters). If you beat all 4 stages, you’ll beat the Battle Mode. If another human player presses Start on controller 2 during a 1-player Battle Mode round, the round will end and the two human characters will face each other – the winner of the human vs human match will continue where the original human player left off. Choose from among 12 different characters in Battle Mode. Music & Sound: The sound effects are great. Each character has different voice samples (in Japanese!) for when they beat a stage. Bomb blasts sound great too, as well as the hilarious death ‘screams’ of the Bombermen. The music is quite good for the most part, with the exception of a few of the levels, where the songs are a little slow-paced and uninteresting. Language Barrier? No. When played on a U.S. Neo Geo AES, almost everything is in English, except for a few text boxes in Japanese when you beat a stage on Normal Mode. If you play Neo Bomberman on a Japanese console, you’ll get Japanese on the ‘Mode Select’ Screen, and on a European console, you’ll get Spanish. Even if you have a European or Japanese AES, however, the game is still mostly in English, and there’s nothing to prevent your enjoyment of the game. So, where can I find this game? You can find MVS arcade cartridges on eBay, usually. Remember, the game was never officially released for the Neo Geo AES, but some websites offer professional conversions, like the one used for this review. You can also play the rom on a computer emulator. Boss fights await at the end of each of the 5 levels. Conclusion: There are dozens of Bomberman games that have been released on a number of different video game consoles, but only one for the Neo Geo. Personally, I love this version – both the Normal Mode and the Battle Mode are extremely fun and balanced. 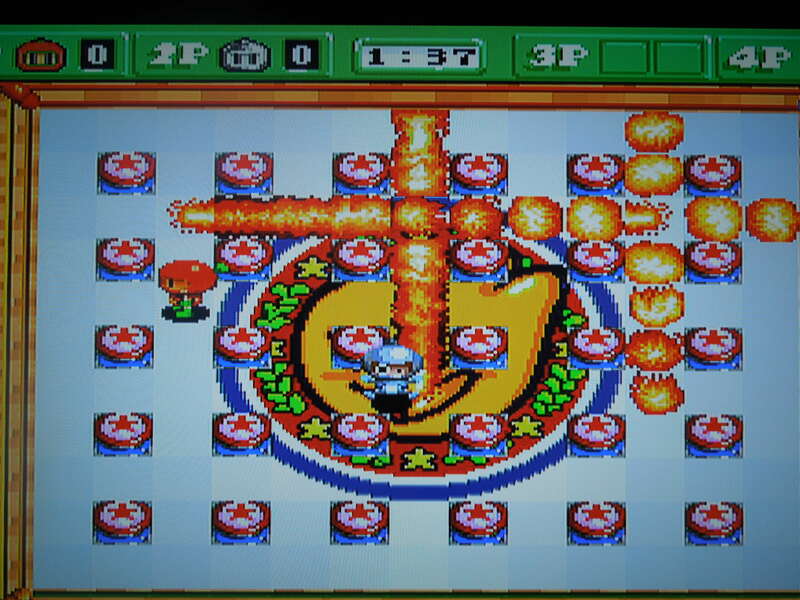 Comparatively, many other Bomberman games offer support for 3 or 4 players, but this one only has 2, which many would see as a letdown – it’s not (in my opinion). Playing against another human player in Battle Mode is just as fun as ever, despite not having other characters to fight against. The co-op Normal Mode is fantastic to (or even just for one player), and although you have unlimited Credits, that doesn’t spoil the game. The reason for this is that if you lose all 3 of your lives and have to continue, you’ll lose all the powerups you’ve gained, giving you extra incentive not to die. The only change I would make to Neo Bomberman would be to add memory card support. As it stands, I would estimate it takes about an hour and a half to beat the Normal Mode straight through (less time with two human players). You also get points for beating stages quickly, rescuing trapped Bombermen, and killing enemies, and you’ll have a high score at the end of the game. Although you can’t save your high score on the High Score screen, writing down your score on the ‘old dry erase board’ (my version of ‘saving’ high scores on video games) gives you something to shoot for on your next playthrough.